These exceptional antique Spanish silver plates have a hexafoil shaped form. 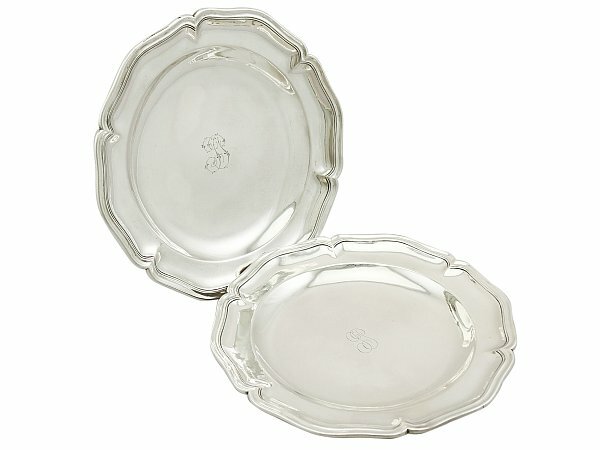 The surface of each plate is plain and embellished with the engraved initials 'IT'. The plain raised borders of the antique plates are encompassed with an applied moulded border accented with tooled decoration. These antique Spanish plates are an exceptional gauge of silver for their type, exceptional quality and in excellent condition in keeping with age. The plates have some surface wear as to be expected, in keeping with age and use. The Spanish hallmarks struck to the underside of each plate have wear in keeping with age.